HIVE is a pavilion built in three days through a new process of human and robot collaboration. The project was created in partnership with Autodesk Applied Research Lab, Autodesk Research, The Living, an Autodesk Studio, The University of Stuttgart Institute for Computational Design and Marcelo Coelho Studio. 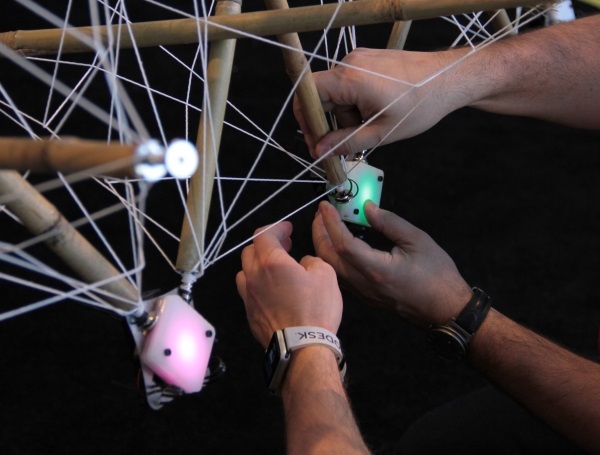 Hive is an innovative and interactive exhibit that was showcased at Autodesk University 2015, Autodesk annual’s conference that attracts more than 10,000 design, engineering, and manufacturing professionals. The project involved a 12’ tall bamboo pavilion that was built by attendees of the 3 day event, through a unique human, machine, and robot collaboration. With this multi-disciplinary project, we were exploring a number of future-of-design themes, such as emergent design, wearables, internet of things, and human-robotic interaction. Hive was a cross-disciplinary collaboration between Autodesk Applied Research Lab, Autodesk Research, The Living, an Autodesk Studio, The University of Stuttgart Institute for Computational Design and Marcelo Coelho Studio. 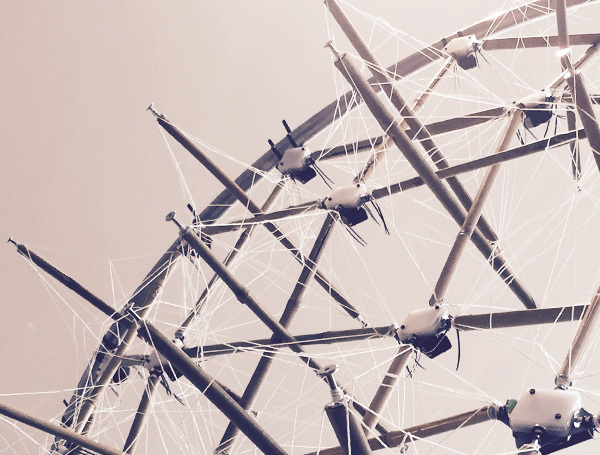 This project forefronts a combination of experimental technologies for design and construction, including tensegrity structures, generative design, robotic construction, and interactive wearable computing. Robots (UR-10) were provided by Universal Robots. Summary video of the HIVE build at AU. Video explaining the process behind building the HIVE.